The larynx can be considered to be divided into three parts, the glottis, the supraglottis located above the glottis, and the subglottis located beneath it. 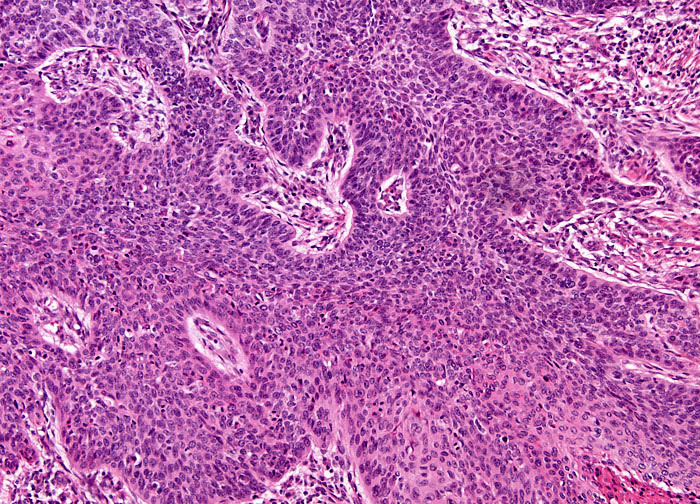 When carcinoma strikes the glottis, better known as the vocal chords, the disease can usually be detected very early. This is because even a minor change to the vocal chords can cause hoarseness, which should always be brought to the attention of a medical professional if it is still present after two weeks of its onset, and there are few lymphatic vessels in them, which reduces the possibility of metastases. Cancer of the supraglottis and subglottis may be harder to detect, however, and are often not noticed until they have reached a more advanced stage or have spread to the vocal cords or lymph nodes, the latter of which generally results in a palpable lump in the neck. Signs of these laryngeal cancers can include a persistent cough or sore throat, labored breathing, problems or pain associated with swallowing, earache, and weight loss.